William Hill’s offer plenty of enhanced odds and specials on a daily basis, check out a few enhanced specials at today’s meeting, including their regular High 5 bonus offer and a jockey enhancement, with both coming from Huntingdon. 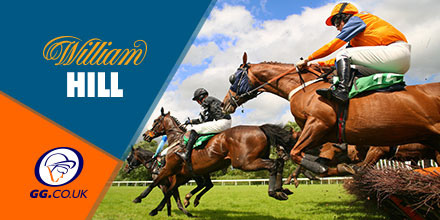 William Hill’s High 5 offer gives a 15%-win boost if your horse was to win by five lengths or more, this is up to a maximum of £100 and is paid in free bets. To qualify, simply place a bet on a selected race or meeting under this offer and if your selection wins, receive bonus winnings as a free bet! William Hill are offering money back on horses that finish second and third in the 5:25pm Race at Kempton on Saturday. Simply place a bet on the race and if your selection finishes either second or third, get your money back as a free bet, to a maximum of £25, with the free bet valid for four days after. William Hill are also offering extra places on the 2:40pm Newbury, the Be Wiser Juvenile Handicap Hurdle, which features big favourite, Friend Or Foe. In this race, Hills are paying SIX PLACES a one fifth odds, minimum of 12 runners. Get SIX PLACES on the 2:40pm at Newbury Here! 18+, open to all customers and T&C’s apply.